William Henry McCarty, Jr. – Billy the Kid’s official birth name. Henry Antrim – In 1873, Henry’s mother married a man named William Antrim. To avoid confusion with two Williams in the family, Billy the Kid’s mother started calling him by his middle name, Henry, and the boy took on his stepfather’s last name. William H. Bonney – In 1877, Henry Antrim started using William H. Bonney as an alias after he murdered Frank “Windy” Cahill, and escaped to New Mexico to avoid a death sentence. Although the reason for the name “Bonney” is unknown, some speculate that this was his biological father’s name before his mother married a man named McCarty, who may or may not have been his biological father (not much is known of his biological father). McCarty may also have been his mother’s maiden name. The Kid – Many of his associates nicknamed him “The Kid” because of his youthfulness and slender build. Billy the Kid – In 1880, during the final year of his life, newspaper reporters and dime novelists, who often embellished stories about the young outlaw, started referring to him as Billy the Kid. Billy, of course, was used as a nickname for William. As the legend of “The Kid” circulated, so did the nickname that most people know him as today: Billy the Kid. Thus, William H. McCarty, Jr. is considered Billy the Kid’s real name, not William H. Bonney. Throughout his life, in his pursuit to earn a living, Henry worked in a butcher shop and in a hotel where he washed dishes and waited tables. He also earned money as a ranch hand, gambler, horse thief, and outlaw. Based on the only known photo of Billy the Kid, most people thought he was left-handed because his gun was positioned on his left side. Only after discovering that the photo was actually a reversed image, did people realize he was right-handed. Despite being known as a cold-blooded killer with a short and violent temper, McCarty was reportedly widely liked by those who knew him. He supposedly had a laid-back attitude and a great sense of humor. Henry was often targeted for bullying because of his slender build. Billy the Kid was known to use the Colt single action .44 and Colt double-action .41 caliber called the “Thunderer.” He may have also used the .38 caliber version called the “Lightning.” The weapon he favored, however, was the Winchester 73’ rifle. 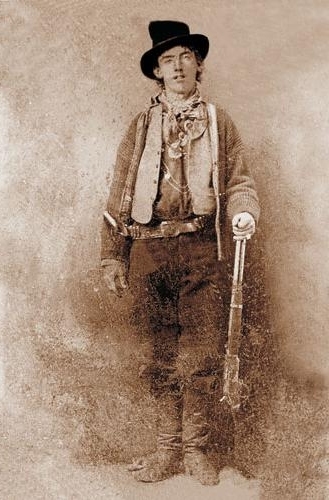 Billy the Kid’s legend claims he killed 21 men in his lifetime–one for every year of his life (if he indeed lived to actually see his 21st birthday)–when in truth, history can only account for four: Frank Cahill (self-defense), Joe Grant (self-defense), and James W. Bell and Bob Olinger–jail guards he shot as he escaped from his hanging sentence for the murder of Sheriff Brady. Although five other deaths are associated with his name, Billy the Kid was merely part of the group that killed them, though the bullets from his gun may not have been the killing shots. Billy the Kid was most known for his involvement in the Lincoln County War. The Lincoln County War was fueled because of a business feud between James Dolan and John Tunstall. Recruited to fight for Tunstall, Henry developed respect and loyalty for the older man, so when the feud between Dolan and Tunstall escalated into bloody violence and Tunstall was killed, Tunstall’s ranch hands, the Kid included, formed a vigilante group called “the Regulators” to take revenge on Tunstall’s killers. Billy is said to have loved books and music, and some say he was quite a good singer. The youngster rarely drank liquor. He didn’t smoke, but he loved to gamble. Henry spoke fluent Spanish and was quite the lady’s man, especially among Hispanics. His mother died of tuberculosis in 1874 when he was only fourteen or fifteen years old. Henry spent time in foster care and in a boarding house since his step-father wanted nothing to do with him, and the teenager was forced to pursue odd jobs to earn a living. Most noticeable apparel: A Mexican sombrero. After being thrown in jail for helping a friend hide stolen laundry, Henry escaped by climbing up the chimney. Around 16 years of age, Henry engaged in an argument with a bully named Frank “Windy” Cahill, who had a history of beating the scrawny teenager. When the fight turned violent, the Kid managed to free his gun and shoot Cahill. This was the first person he killed. As an outlaw and fugitive, he was unable to find honest work to support himself and reluctantly joined a gang as a means to survive in the hostile and lawless territory. In the attempt to explain this young outlaw’s descent into a life of crime and violence, some say he was influenced by the dime novels he read which romanticized crime. Others attribute his lifestyle to the fact that he was often a target for bullying and fell in with the wrong crowd. He was often seen as a impressionable individual who was influenced by those he associated with, either for good or bad. In 1881, Billy the Kid was captured by Pat Garrett, the Lincoln County Sheriff, for his involvement in the Lincoln County War, and he was found guilty of killing Sheriff Brady. The Kid was the only one convicted and punished over the events of the war. Billy the Kid added two more murders to his record when he shot and killed his two jail guards, James W. Bell and Bob Olinger, in order to escape a death penalty for murder. From here, the Kid was a wanted man. Although some say Billy the Kid died when he was 21 years old, since no one can confirm his birthday actually occurred in 1859, the Kid may have only been 18-20 years old when he died. Most of what the general public knows about Billy the Kid today, holds no truth. He is considered one of the most misunderstood historical figure of the Old West, probably because of the amount of myths associated with his name and life. Billy the Kid is known as the Old West’s most favorite outlaw. When I find an interesting article or fact, can I share it on Facebook (w/full credit to you site of course.) If so, how can I do this? @Judy: Of course, just share the link on facebook. Simply stating that you are in fact the 3rd cousin of William doesn’t really do much to convince me that you would know any more than anyone else. If you are indeed his 3rd cousin and know things about him most people don’t then you should write your own book on the subject. Otherwise people have no choice but to research the material that is available and come to thier own conclusions. And Jesse James claims to be a relative of the outlaw Jesse James but refuses to provide a DNA sample to prove it (or any other evidence for that matter). Wonder why? I have found a grave of William H Bonney. It may or may not be your relative. My question is, when did young men start being called Jr.? I just saw Billy’s name as William Henry McCarty Jr.. Knowing what they did with the name Antrim. It is not far fetched to say his real name was William Henry Bonney Jr… I have 2 tintypes in leather cases that COULD BE, Patrick McCarty and Catherine. When I had them enlarged my photo guy said, this man was not doing well! My Catherine is somewhat older then the Picture they use of Catherine, I would guess the Tintype around 1860. Billy The Kid was born around 1858-1860 near Rolla Missouri. No, Billy told one of the Cole’s he was from NY. I’ve heard some thoughts on him being from Missouri. Can you offer why you say he’s from Rolla? Looks like several folks have posted that they are related to the kid. His name was William Henry McCarty. His step father’s name was William Henry Antrim…go figger. My great great uncle’s name was William Henry McCarty and his brother told my father that we (meaning my family) are related to Billy. Billy said that his folks were from Missouri, and at the time, so were mine. If, I am indeed, related to the kid, then his father’s name was John McCarty who died in Andersonville prison on 6 November 1864. Billy was a hot headed ladie’s man who loved to hunt and shoot. Yeah, he sounds like me. 2- Until his mother married Atrim, He was known as Billy Bonney, Bonney was his mother’s maiden name. 3- When Cathrine married William Henry Atrim, She gave Billy the same name. but she called him Henry to avoid confusion. 4- Atrim was such a nice guy, when Cathrine died, he abandoned Billy and his brother. I swear half of you people get your facts out of cereal boxes. Henry is my great grandmother’s son Catherine McCarty. His family called him “Matchstick” as a nickname. I was lucky enough to receive a pocket knife and a fishing pole from my Grandmother that was Henry’s “Billy the kids” what I’m told threw my family is that it’s basically one big game of phone tag. Most of what is said about Henry is not true. This story sold with the papers back then and Most of history. He was not a tough guy at all. However, was gullible and a loyal guy. After incarceratted for killing someone who was trying to kill him and looking at death for that. what would anyone do in those brutal times??? Wow! I am also his distant cousin! That’s crazy. Hello, cousins that I have never met before! Haha. My mom tells me that I get my relation of Billy the Kid from her side if the family. And I believe it. Haha. Scott Billy lived in a time of little law as we know today. The law was who had the money for their benefit. Billy was really against the Sante Fe Ring a arm of Twee tum Hall New York. In the right hand picture the buttons on his vest &his gun belt buckle is on the right side. Steve McCarty, I’ve found you on several sites and left messages but I don’t think you’ve seen them. It’s been several years since I talked to you, after you found the box full of photos. Contact me again, have had some info gaines that are interesting. Steve McCarty – it’s about the research on the book and the old west connections. Your photos are a big hit where ever you show them, the real stuff, I think! I believe the new evidence that Billy’s death was a fake and he lived a long life and is buried at Hico, Texas. I would really love to know through DNA whether his mother was Catherine Antrim or Mary Roberts. To the third cousin: I think if your GGM was a first cousin, you’d be a first cousin 3x removed, not a 3rd cousin. I would like to counter the main statement in this article, as of today, there is not proof that anyone has found Billy the Kid’s birth Certificate. Donald Cline wrote a book and claimed to have found Billy the Kid’s birth certificate. I expect that is where you attained this information. That book and many of the details in it, were proven false. He has no proof to back up any of his claims, and therefore, cannot be accepted by anyone looking for the truth. If you want to read something based in fact, please read Frederick Nolan’s book, The West of Billy the Kid. This is, in my opinion, the most accurate book written on William Bonney. The reason I use the name William Bonney for Billy the kid is simple, that is what is on the court records. That is on the letters he wrote to the Governor when he made is deal. Why would he use an alias when dealing with the Court system or the Governor? he found that many people didn’t do the research that was needed, but took word of mouth as fact. The story told in my family is my great aunt was a bit of a outlaw herself and from what I’m told is she provided William Bonney a place to hide out in her home in Santa Rosa, NM. I’m told that she became William Bonney’s sister-in-law. I remember great auntie. She always managed to slip me money when she came to visit. I was about 5 or 6 years old. Mrs. Fitzu, I like your Billy story a lot. Can you email me at [email protected] . What do I know? Billy the Kid or Billy the Kid LeRoy and Kid Antrim or The Kid or William H. Bonney were in the same state, NM, at the same time. Also when you throw Joseph Antrim into the mix you “MAY HAVE” 3 Billy the Kids! I would like to know your Great Auntie’s name, birth and married. Thank You.